Class for geometric model for collision detection. A rigid body that interacts through contact must have a collision model. Sets the pointer to the contactable object. Add a sphere shape to this model, for collision purposes. Add an ellipsoid shape to this model, for collision purposes. Add a box shape to this model, for collision purposes. Add a rounded box shape to this model, for collision purposes. 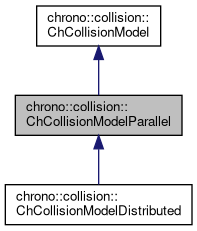 Add a triangle shape to this model, for collision purposes. Add a cylinder to this model (default axis on Y direction), for collision purposes. Add a rounded cylinder to this model (default axis on Y direction), for collision purposes. Add a cone to this model (default axis on Y direction), for collision purposes. Add a rounded cone to this model (default axis on Y direction), for collision purposes. Add a capsule to this model (default axis in Y direction), for collision purposes. Return the axis aligned bounding box for this collision model. Return a pointer to the associated body. Set the pointer to the owner rigid body. Return the number of objects in this model. Gets the pointer to the contactable object. Add a barrel-like shape to this model (main axis on Y direction), for collision purposes. The barrel shape is made by lathing an arc of an ellipse around the vertical Y axis. The center of the ellipse is on Y=0 level, and it is ofsetted by R_offset from the Y axis in radial direction. The two radii of the ellipse are R_vert (for the vertical direction, i.e. the axis parellel to Y) and R_hor (for the axis that is perpendicular to Y). Also, the solid is clamped with two discs on the top and the bottom, at levels Y_low and Y_high. Currently not supported. Add a convex hull to this model. A convex hull is simply a point cloud that describe a convex polytope. Connectivity between the vertexes, as faces/edges in triangle meshes is not necessary. Points are passed as a list, that is instantly copied into the model. Add all shapes already contained in another model. Thank to the adoption of shared pointers, underlying shapes are shared (not copied) among the models; this will save memory when you must simulate thousands of objects with the same collision shape. The 'another' model must be of ChModelBullet subclass. Add a triangle mesh to this model, passing a triangle mesh. Add a triangle mesh to this model. Note: if possible, for better performance, avoid triangle meshes and prefer simplified representations as compounds of primitive convex shapes (boxes, sphers, etc). is_static true if model doesn't move. May improve performance. is_convex if true, a convex hull is used. May improve robustness. Sets the position and orientation of the collision model as the rigid body current position.